Do you ever feel like someone is watching you from behind? I couldn't resist taking photos with the eyeball! This is a rare lunchtime photo shoot. I had to improvise and take photos during the week because of my weekend trips at the end of May. A fashion blogger's work is never done, right? But, I was happy with our shoot location, and even more happy about this outfit! I put together this flat lay here after experimenting with some older pieces in my closet. I loved the outfit without the vest, but I loved it even more *with* it. I like to call this 90's chic. I thought I put this vest in the donate pile because it hadn't fit for awhile, but I was relieved to see it still hanging there since it fits perfectly again! It's the perfect fitting vest with just enough stretch so that it's not at all boxy like a lot of denim vests are! And the fact that it's still available in stores after 3 years?! That's a miracle. I had a pair of white flats that I wore all the time when I was in middle school. I like to think that these heels are the grown up version of the flats from my youth! I think I may cry if anything were to happen to these heels. They're just a really great pump all around. I'm headed back from Vegas later this afternoon and I'm sure it will take every bit of this week to get recovered! I'll definitely be sure to recap the weekend for you in a future post! 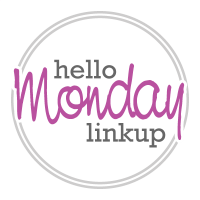 For now, be sure to link up and have a great week! Glad you kept this fun denim vest. It's a great layering piece! Cute outfit with the denim vest, def feel the 90's vibe. The giant eyeball is such an interesting photo op. 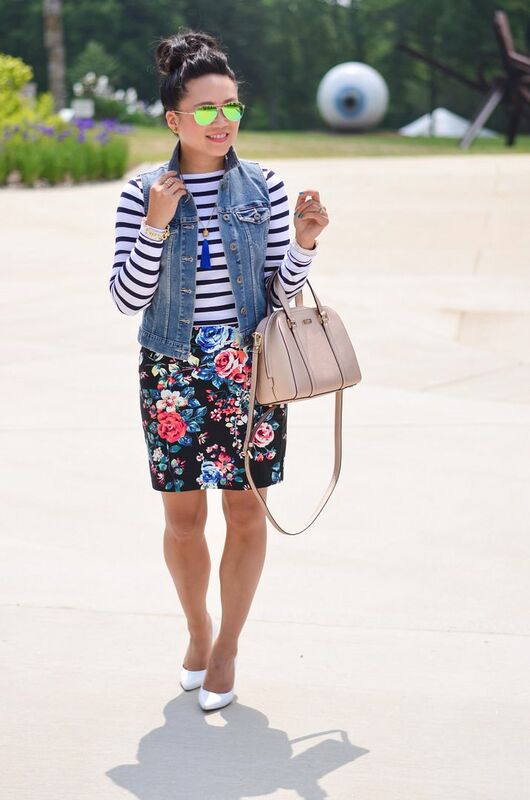 Love the stripes and florals together, great combination! This outfit is perfect and I need to wear my white pumps soon, love these. Such a stylish throwback to 90s. I will be posting an outfit with a vest, soon on the blog, this week. Your skirt and pumps are so pretty. I need white pumps. Take your time relaxing after Vegas, Caryl. I love the addition of the denim vest. Such a polished and flirty look. Love the mix of prints with this look and that denim vest is so cool! 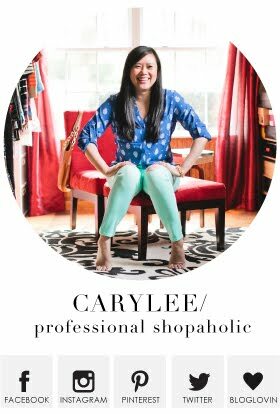 You styled this outfit to perfection Carylee! Obsessed with this entire look head to toe! The perfect mix of prints!! Have a great Monday girl! 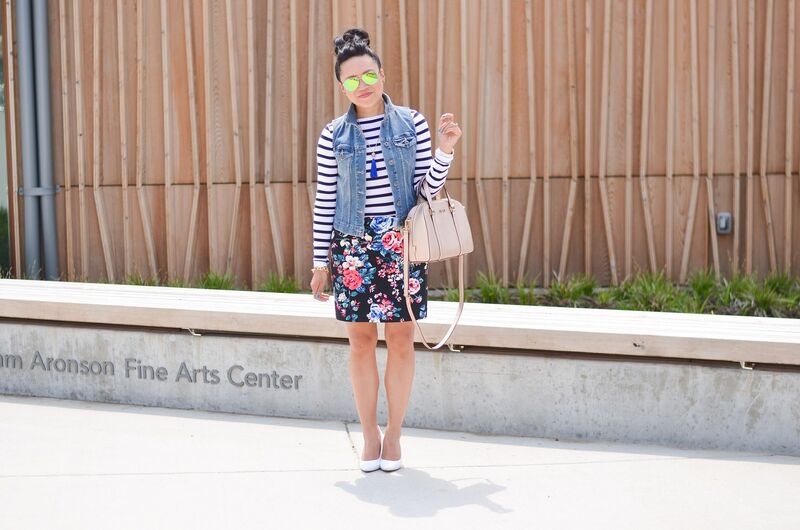 Stripes, denim and anything floral - love the mix! Thank you for hosting Carylee! Love this outfit! It's the perfect mix of patterns. Hope you had a great time in Vegas. 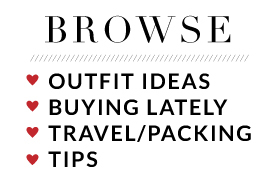 Amen to a fashion bloggers work never ending haha! Cute outfit Carylee, you are a mix prints queen. Ha, that eyeball in the background is great. 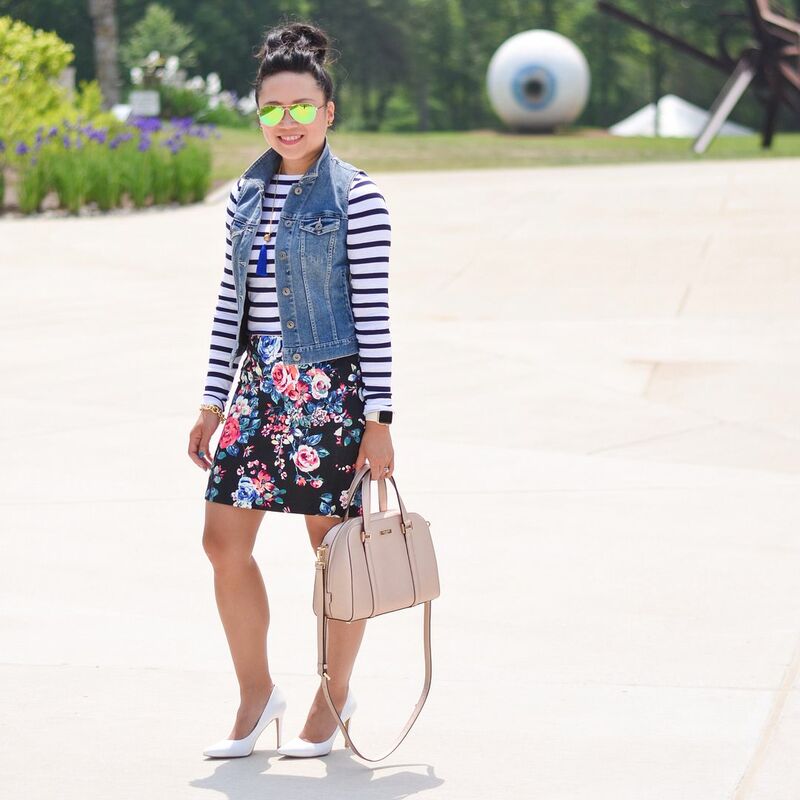 I love everything about this look--the stripes and floral mix, the vest, those fab white pumps. LOVE. Loving how this outfit came together! Such a good print mix with your denim. I need those white heels! May always seems to be such a busy month. The vest makes mixing prints feel so much easier for me---not that the outfit doesn't look great without it, but somehow (as a print mix newbie), the vest is the perfect topper! Yay, I've finally got a style post to link up!! So happy to be joining in, thanks for hosting, do come and join my All About You linkup on Tuesday! I always look forward to your posts because your outfits are so inspiring! You put together things that I never would and you look so cute! 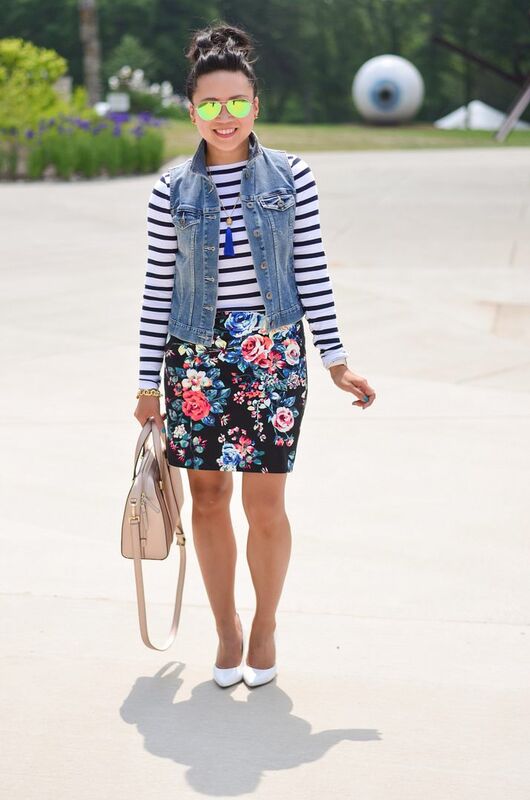 I love the floral, stripes, and denim! Also...that eyeball!!! Super cute outfit! Isn't it such a great feeling when you hang onto something for so long that you eventually do gravitate toward it again? I'm having that experience this season with some wedge sandals that I have held on to for years. I'm so glad I did! This skirt screams spring! Adore this look! I love the look. I also linked up my post with my outfit for church. Elie Tahari for the win. This is such a cute look! It reminds of something Kelly Kapowski(Save by the Bell) would wear! There are so many fun elements to this look!! Love the pattern mixing. OMG, I'm in love with the floral/stripes combo! How fun and I am reeeeally loving that skirt! You look adorable, as always! 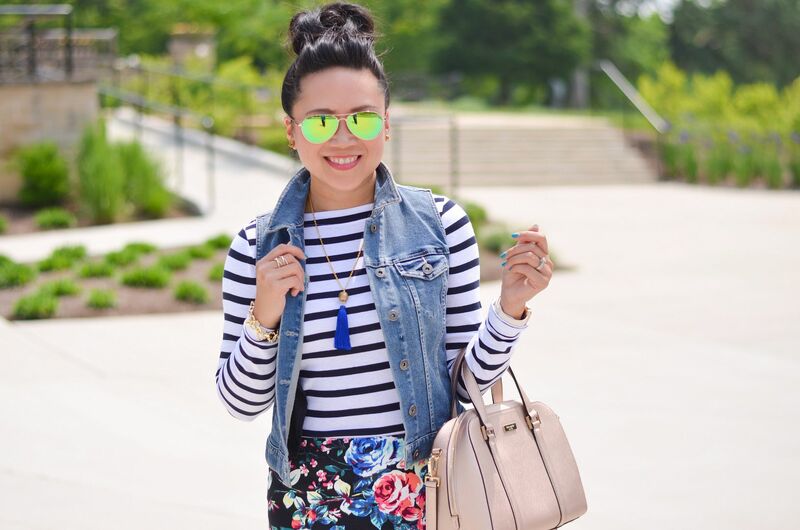 Stripes and floral print is a fabulous combination! Thanks for hosting, hope you have a great week!